French fancies abound in this group show of work from nine artists – five French, four from Scotland – mixed and matched across two galleries that bridge the gaps between Edinburgh's New Town and the city's West End. This is made explicit in Samantha Boyes' florid constructions, which at first glance look like afternoon tea is being served, until you notice the assorted stuffed birds’ heads and other wildlife nesting within. This sets an anthropological tone that sees much monkeying around throughout. Where Jacob Kerray's chimps in military drag come on like dressing-up box tinpot dictators, Dix10's pistol-packing infant taking aim at a kids’ entertainer's dog-shaped balloons in fatal repose gives similarly subversive edge to such otherwise cutie-pie subjects. Elsewhere, few do this better than Rachel Maclean, whose explorations of national identity by way of day-glo heritage industry kitsch were first seen at Edinburgh Printmakers in 2013. While there are no concrete connections between artists other than geographical borders crossed, diversity, conflict and the tensions between the two seem to be the point. Roma Napoli's arm-wrestling Action Men and Paella's duelling bagpipers in particular show just how fragile alliances can be. Institut Français, Edinburgh & E.D.S. Gallery, Edinburgh, both until Sat 1 Nov.
Work by Scottish and French artists, including Megan Rea, Hélène Lhote, Paella Chimicos,Jacob Kerray and many more. A joint exhibition by Scottish and French artists, featuring work by Samantha Boyes, Ross Macrae, Jacob Kerray, Hélène Lhote, Paella, Dix10, Roma Napoli and Black Sifichi. 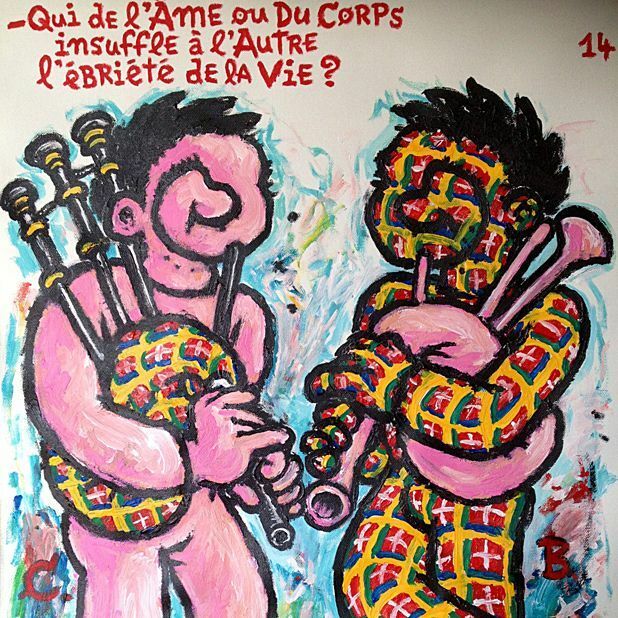 A companion exhibition is running concurrently at Institut Français d'Ecosse in Randolph Crescent.